Would you believe I’d never made a flag cake before this year? Typically, around the 4th of July, I goad my mother into making her classic strawberry shortcake and I make out like a bandit, stuffing my face with the ambitiously sized bowl of tender shortcake I layered with fresh strawberries and real whipped cream. Even pregnant, I can never finish the bowl I allot for myself! So that’s really saying something. The whipped cream frosting is so, so easy to make and painfully delicious. 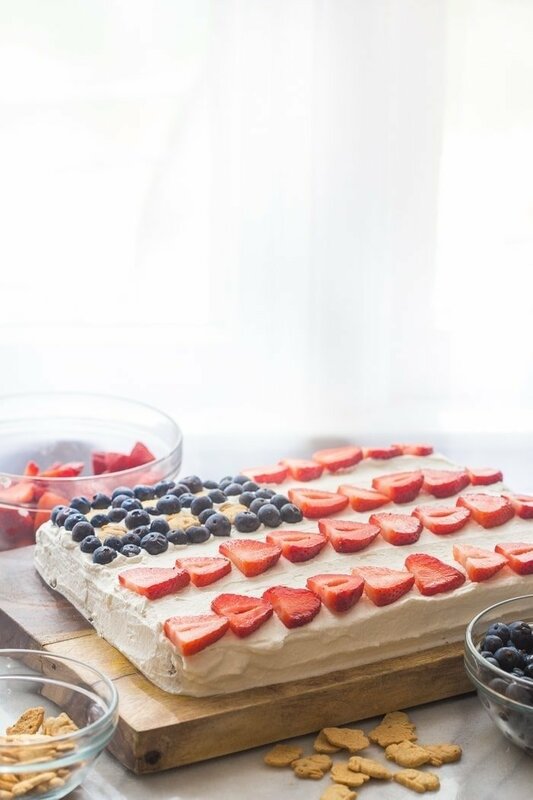 So when I paired up with Annie’s Homegrown to create a festive and fun–but still elegant!–flag cake for the patriotic summer season, I was inspired by the flavors I love in a strawberry shortcake. 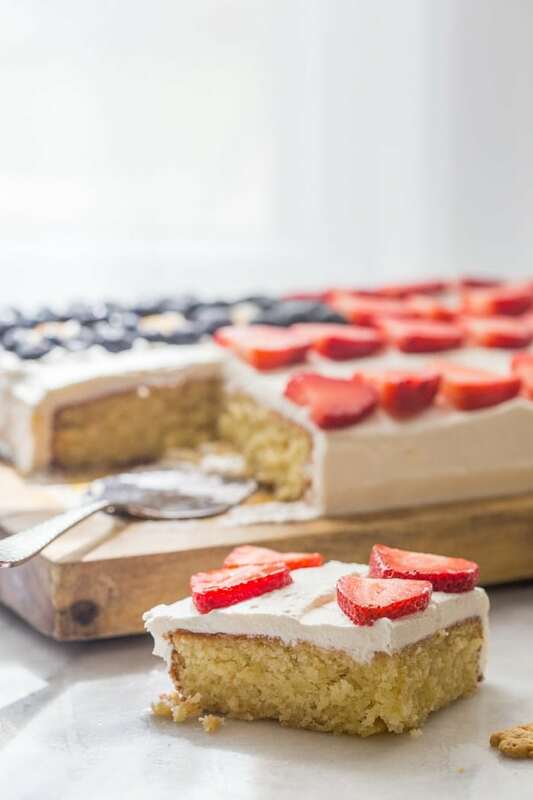 When I was brainstorming my recipe, I knew I wanted to pair a dense, rich cake with ripe strawberries, all offset by a light, über-creamy whipped cream frosting to balance the richness of the cake with an airy lightness to tie it all together. And in the meantime.. I sort of developed an addiction. So, the strawberry shortcake thing has been going strong for years–I blame it on my mother’s commitment to making actual shortcake and using real, fresh strawberries and whipped cream from a pint–not a canister. And since I’ve been pregnant, my cravings have come and gone, starting in the form of honeybuns (Yes! Those honeybuns! I even tried to find a proper recipe, but there’s just no way to mimic the trans fats in those little guys, pretty sure), moving to sweet tea, and settling in as strawberry shortcake-inspired dishes. I happened to be lingering by the bakery section at Whole Foods waiting on some food for a client shoot–I get paid to photograph cheeseburgers, and no, you can’t have my job (I really.. really like it. Like, a lot. 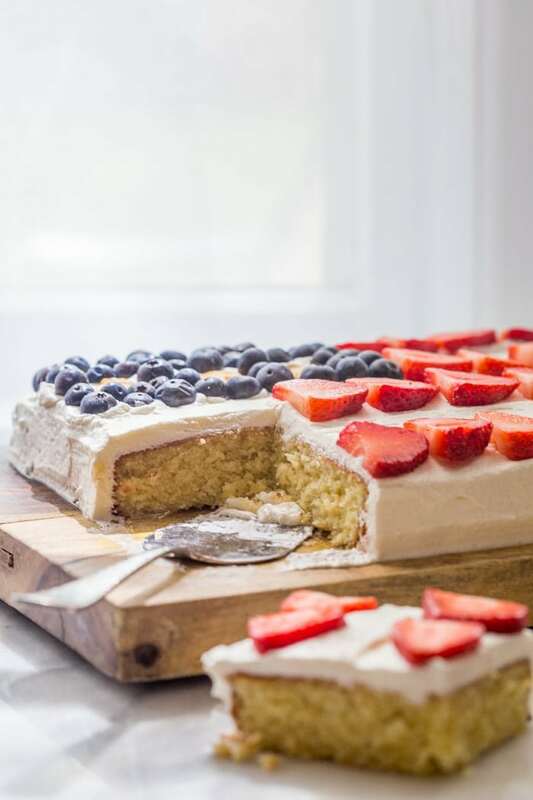 )–and spied a massive slice of yellow cake layered with strawberries and topped with a light whipped frosting. I smuggled a slice out–though I’m not sure if ‘smuggle’ is the right word, given I paid for it with my own personal account, holding up the line while I separated my orders from the client’s at precisely noon–and fell deeply in love once I managed to make it home and consume the confection, crouched over the thin plastic box like they literally starve me. Something like six slices later, I knew I had to draw inspiration from the Whole Foods take on strawberry shortcake as well, so I slathered a rich, entire-box-of-butter yellow cake in a whipped cream frosting, fortified by a touch of cream cheese and granulated sugar, topped with ripe strawberries and blueberries, dotted with crunchy, too-cute Bunny Grahams representing the states on our cake. The cake is so dense and rich, which I love alongside a more understated frosting and touch of fresh fruit to bring it all home. Make sure you don’t overbake it, or it’ll turn brick-like, which, you know, we don’t want. But blame it on the pound of butter you’ve got in there, sister! And considering there’s no butter in the whipped cream frosting, I call it a draw in terms of luxuriousness.. How luxurious of me, non? The Bunny Grahams make this cake just perfect to serve to kids, while the richness of the cake and lightness of the frosting are elegant enough to sate even the most difficult of adults (you know who I’m talking about..). And even though our little one is still safely tucked in his little amniotic bed in my belly, I loved pressing the Bunny Grahams in between the blueberries, thinking about what he’ll be like when he’s here, what he’ll like to do and eat, what kind of personality he’ll have, and if he’ll need a haircut at the hospital, given the heads of hair on his mama and daddy. Because.. I really can’t freaking wait to meet him, even though I am equally terrified by the imminence of his arrival and all of the tasks on my to-do list that that entails. Better eat more cake to fortify myself! My ridiculous stash of cloth diapers needs re-sorting, pretty sure. All opinions, recipes, and photos are my own! Make sure you join Team Annie’s–a fun social community where fans get special access to the world of Annie’s and can share their love for Annie’s delicious products (did someone say “Mac and Cheese”?!)! 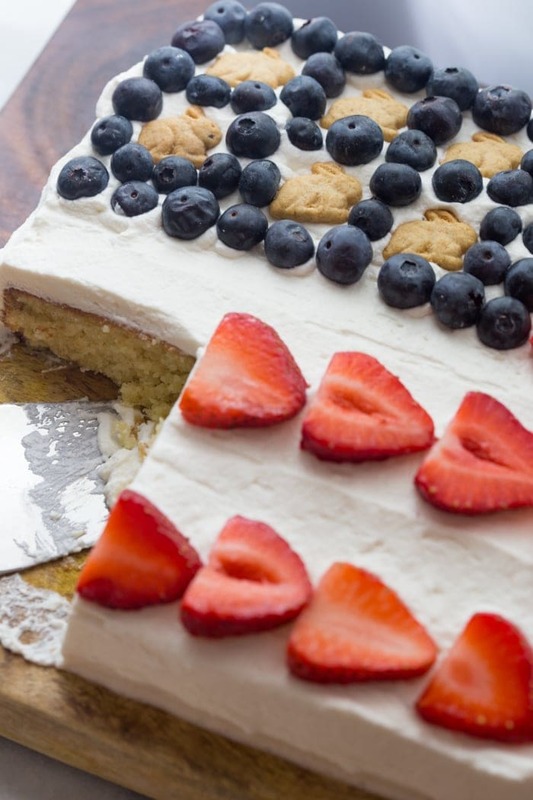 A rich yellow cake slathered with whipped cream frosting (and a touch of cream cheese! ), topped with fresh fruit and too-cute Bunny Grahams. Perfect for patriotic festivities! Preheat your oven to 350º F. Grease and flour a 9x13" rectangular pan. In a small bowl, sift together the cake flour, baking powder and salt. In a large bowl, cream the butter and sugar together until light and fluffy. Beat in the egg yolks one at a time, then stir in the vanilla. Beat in the flour mixture alternately with the milk on low, mixing just until incorporated. Scrape batter into prepared pan. Bake in the preheated oven for 25 to 30 minutes, or until tops spring back when lightly tapped. Don't overbake! Cool 15 minutes before turning out onto cooling racks. Combine cream cheese, sugar, and vanilla extract in the bowl of a mixer (or large bowl with handheld mixer) and beat until smooth. Slowly add in the heavy whipping cream and beat until whipped and fluffy--frosting will hold a stiff peak. 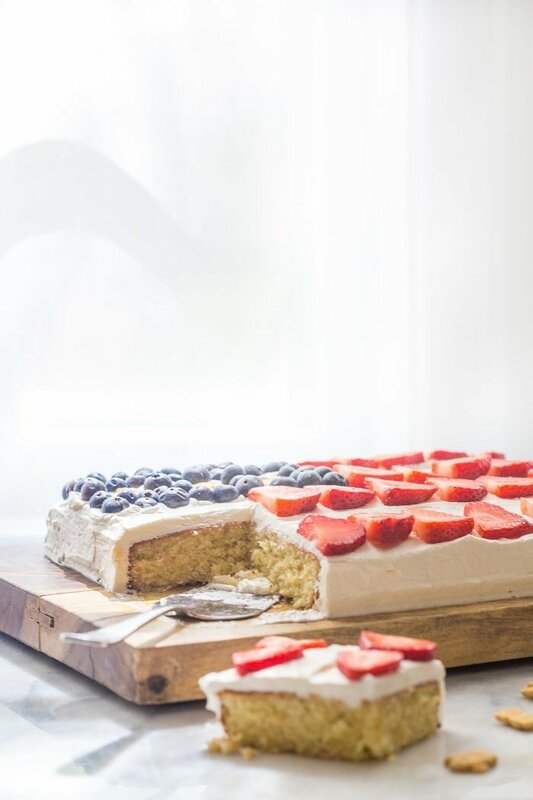 Place your cooled cake on a serving board and slather in frosting, covering all edges and smoothing. 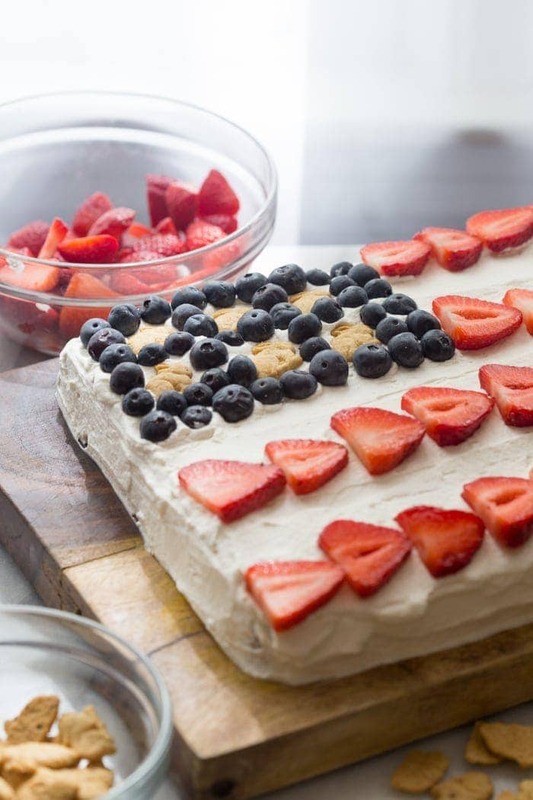 Then create your flag design by making a square at the top left corner out of blueberries, pressing Bunny Grahams into the frosting to act as the stars on the American flag. 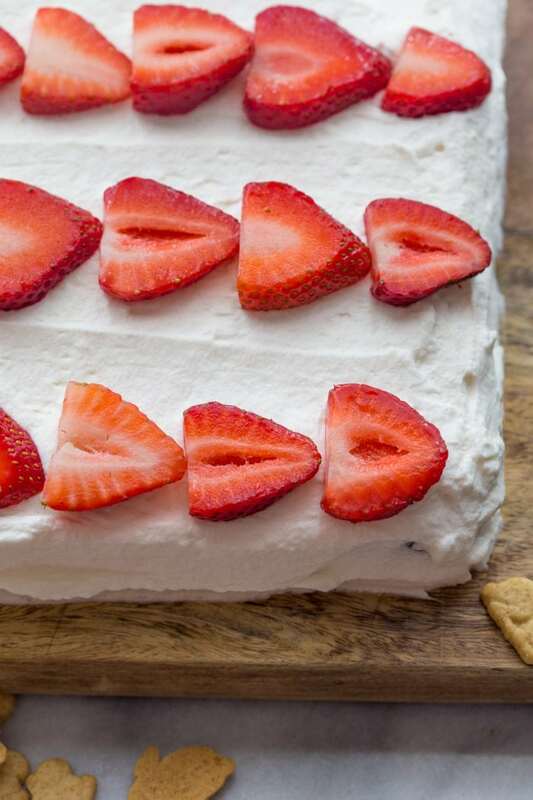 Lay sliced strawberries in horizontal lines to mimic the stripes. Serve! Okay, SERIOUS crushing going down here! 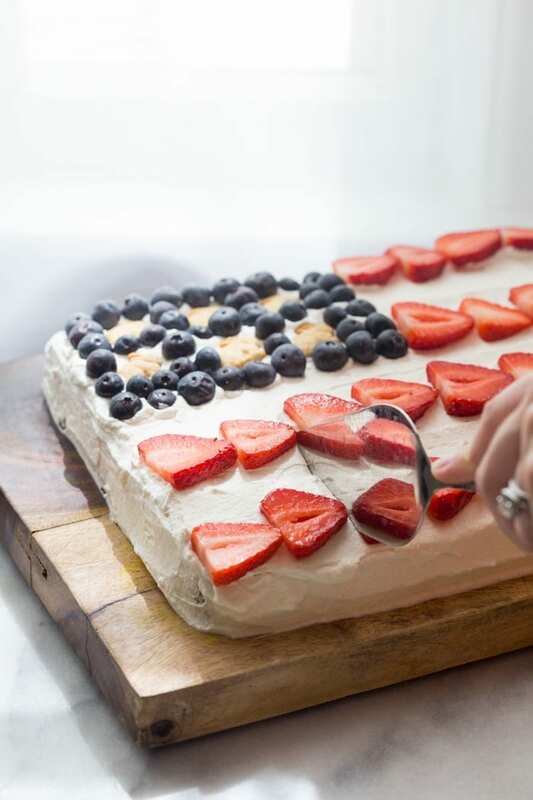 It’s been waaaay too long since I last made a flag cake for the 4th! This cake is totally STUNNING, Cheryl! Man, oh man it looks so ultra-moist and irresistible! 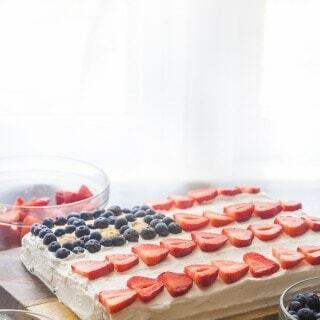 Nothing like a flag cake, well correction YOUR FLAG CAKE, to get me into the spirit of 4th of July. Loving these gifs, layday! That cake looks darn perfect for 7.4. I love that it’s dense & rich. That’s the only way to go in my book. Cheryl, I LOVE this cake!!!!!! LOVE it! and after you have the baby, Annie’s Homegrown products will be your best friend . . 🙂 my kids love all their stuff! Now this is what I call a gorgeous cake Cheryl ! Great job, love it! Totally craving it now! Pinned!